It seems like just yesterday that we started listening to Heidi Klum's now famous catch phrase "one day you're in, the next day your out" as she judged a slew of hopeful designers try to make it big in the design world. In fact, it wasn't yesterday- it was almost ten years ago! And in celebration of the ten year anniversary of the now iconic fashion show Project Runway, a virtual installment is being set up at the Chelsea Market Passage on the High Line. Whenever somebody walks past the installement, virtual emotions of Heidi Klum, Tim Gunn, Nina Garcia, and Michael Kors will be activated- like you're walking down a runway. To prevent Heidi Klum and her team from voicing their opinions all night, the installment will only be turned on from 12pm to 10pm on July 16, from 8am to 12pm on the 12th, and from 12pm to 10pm on the 18th and 19th. "The High Line is, in essence, a runway—visitors from New York City and all over the world come and walk on an elevated platform in the heart of the Meatpacking District, the city's epicenter of fashion and design, so this is an incredible partnership where style, culture and community meet." 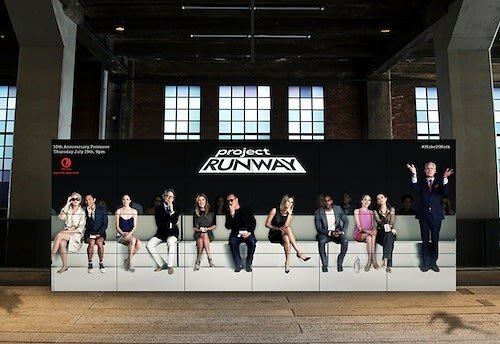 Project Runway returns for an all new season on Thursday, July 19 at 9pm.